On the occasion of his first exhibition in Hong Kong, we speak to acclaimed artist Adel Abdessemed, whose politically engaged, highly sensationalized works often fuel controversy. He reveals to us the conceptual intentions driving the creation of his artwork and evolution of his practice, unraveling why his art is more than just a spectacle, and the significance of its impact on audiences. Images: Courtesy of Tang Contemporary and the Artist. A massive, flattened, used helicopter assuming a circular ring like shape, takes center stage in Tang Contemporary’s airy, high-ceiling Hong Kong space. 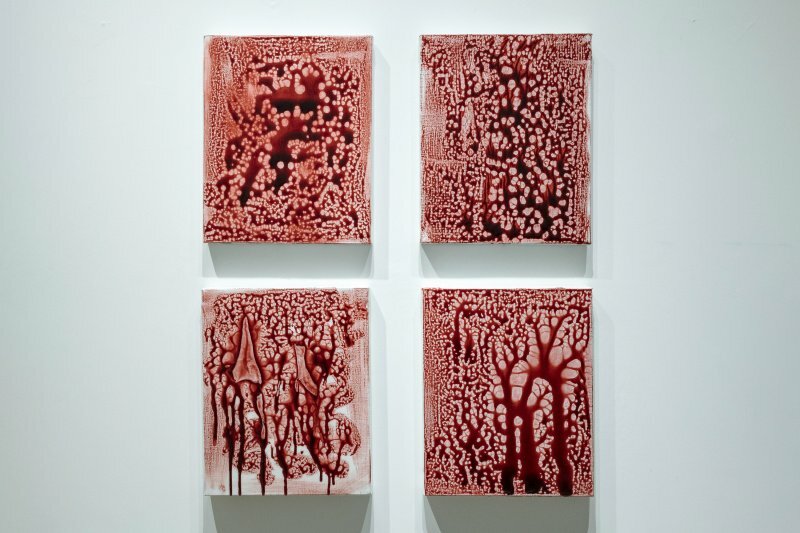 On the walls hang, what appear to be encased grids of congealed blood accumulated into varying patterned forms. Comprising Adel Abdessemed’s latest exhibition, Unlock, curated by Jerome Sans, these new works continue and build upon the artist’s long standing forays into addressing how current socio-political events trigger fear and violence. In particular, the role of perception and deception in our comprehension of the current political narrative. Uprooted from his hometown of Constantine, Algeria in 1994 (a mere ten years after the civil war), subsequently migrating to France, it comes as no surprise that Abdessemeds practice is so inherently informed by the impact of current events, both socio-political and cultural. His dramatic, artistic interpretation of this impact – which often involves recreating its effect, is what sensationalizes, but also distinguishes his practice. The exaggeration and distortion of the helicopter sculpture, entitled Unlock (2018) – the namesake of the show – in itself renders a theatrical atmosphere. While the title of show references the concept of data protection and codes in a digital era, the helicopter alludes to its function as a military and surveillance engine as well as an exclusive means of travel. 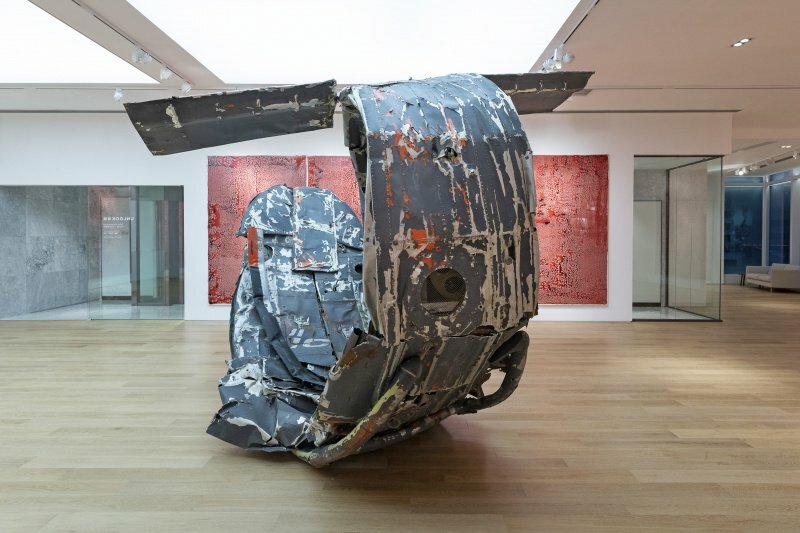 This work is born out of a series of similar works such as Bourek (2005), and Telle mère tel fils (Like Mother, like Son) (2008), where he folds and wraps an airplane into a distorted sculpture. Abdessemed visually alters his thematic content, often times perplexing the viewer, making them question their own awareness, always doing so with an element of drama. In the making of what may be his most well known, and certainly most theatrical work, Adel Abdessemed Je Suis Innocent, (Adel Abdessemed I’m Innocent) (2012), the artist stands on the street, alight with flames, set on fire. Employing special effects to create this illusion, as used in films, Abdessemed simultaneously shocks viewers and questions their sense of perception. A more recent example would be the unfortunate removal (and gross misreading), of his work from a group exhibition, Antidote, held at MAC Lyon. In this video work, Spring (2018), which depicted a row of flaming chickens hanging by their feet, Abdessemed employed the same illusory methods to produce a fake effect, there was no harm done to the animals. Intended to be a critique on animal cruelty, the work was prematurely received by animal rights activists as an unethical display of violence inflicted on animals. This action itself indicative of how we jump to conclusions before familiarizing ourselves with facts and understanding intent, a negative byproduct of mass visual and media consumption. 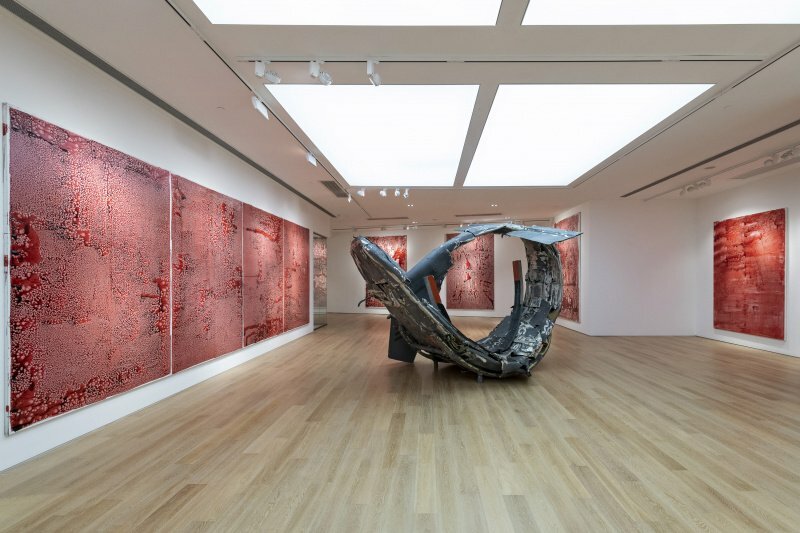 Abdessemed emphasizes that “this craze is fuelled by the media, and the impact heightens the reality.” No stranger to the use, recreation, and scrutiny of violence, in his wok being questioned, the artist insists that the perception of violence is two-fold, and in eyes of the beholder. 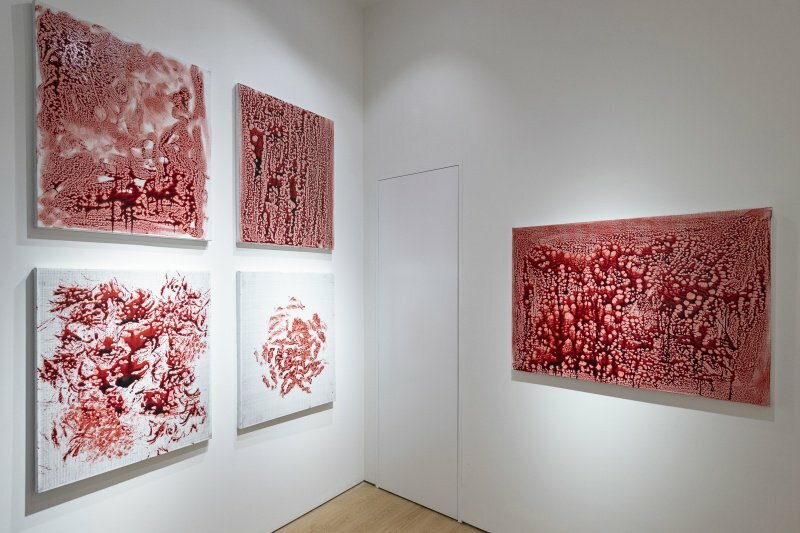 Blood, which denotes violence, but also life, is the conceptual content Abdessemed has chosen to tackle in his latest paintings, as well as the physical material which composes them – or so it seems. Our perception of violence and reality, is what Abdessemed questions and what becomes apparent in the aforementioned series of paintings, Forbidden Colors, which derive inspiration from fake news and contemporary propaganda. From any distance they appear as abstract canvases painted with blood. The artist again, with his signature gesture of deceptive simulation , paints with a liquid used in films to imitate blood. 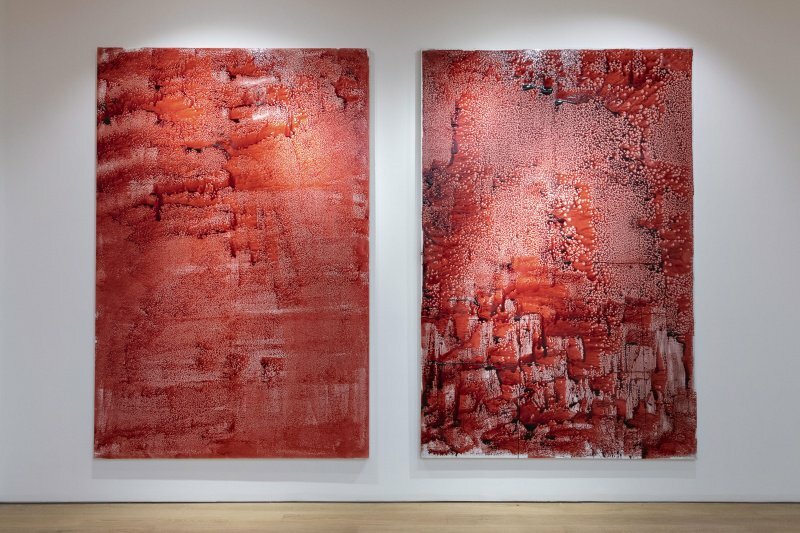 The similarity in color extends to that in form, as the ‘blood’ collects in pockets, dripping down the canvases. This ‘deception’ implicates that which is propagated by politicians, global influencers and the media to a certain extent, through the contemporary phenomenon of fake news and filtered images. “Everywhere it seems there is media and people are taking selfies. When I take a photo, there is real emotion attached it, which the media, and selfie obsessed population often lack. With this fishing metaphor, Abdessemed reinforces his approach in recreating the effect of an inundation of visual imagery. While he establishes his role as an artist, he turns the tables on the viewer, emphasizing what they should takeaway from his work and what good art strives to do. Good art, widely noted by many artists and critics alike, at the very least should leave an impact of some kind on the viewer, evoking emotion, perhaps even one that elicits a sense of discomfort. Much of Abdessemed’s work, including Forbidden Colours, certainly achieves this, but more importantly it raises questions which prove to be significant in navigating todays political and cultural climate. He goes for the jugular, confronting us with our own fears, providing what may be much needed reflection, a wake up call, or as he explains (and exclaims!) it – À L‘attaque! Adel Abdessemed (1971, Constantine, Algeria) is a prominent figure of the international art scene. From drawing to video, from sculpture to installation, Adel probes in the wounds of our present. His work has been the subject, during the last thirty years, of numerous major solo exhibitions, at MoMA PS1 in New York, MIT List Art Center in Cambridge (Massachusetts), Magasin — Centre National d’Art Contemporain in Grenoble, at Parasol Unit in London, Fondazione Sandretto Re Rebaudengo in Turin, Musée national d’Art Moderne — Centre Georges Pompidou in Paris for a retrospective, « Adel Abdessemed. Je suis Innocent » (2012), CAC in Málaga, or at the Musée des Beaux-Arts de Montréal. Two major monographic exhibitions take place in 2018: Otchi Tchiornie at the Musée du Grand-Hornu in Belgium, and L’Antidote at the MAC Lyon. Adel Abdessemed’s work has been presented at four Venice Biennales (2003, 2007, 2011, 2015), where he received the Benesse Prize (2007), at two Biennales in Istanbul (2007, 2017), and in the Biennales of Havana (2009), Gwangju (2008), Lyon (2007), and São Paulo (2006). In 2010, he participated in the first Triennale in Aichi, in 2017 at the Triennale of Milan and at the Triennale Oku-Noto in Suzu (Japan). In 2018 he participated at the Triennale Echigo-Tsumari Art. On the same year, he also took part in the Rencontres de la photographie d’Arles, where he exhibited a series of photographs and sculptures curated by Jean Nouvel. In 2015 he directed the scenography and light of Retour à Berratham, during the Avignon Festival, for the choreographer Angelin Preljocaj. In 2016, he was invited to drawn the poster for the Avignon Festival and to create his project « Surfaces ». At the same time, the organization Bold Tendencies commissioned the work Bristow as part of its artistic program in Peckham (London). Recently, the three-volume monograph came out, Works 1988-2015, published by Koenig Books, bringing together the catalogue of nearly 30 years of creation.